Using an iPhone as a scanner in your pocket can help expand any organizations document capture capabilities. Dynamsoft has introduced a software development kit for iOS app developers to add enterprise-grade document scanning capabilities by easily embedding a mobile capture component in hours or days rather than spending months to build it. The SDK boasts several built-in capabilities such as, automatic document border detection and artifact reductions. The feature set provided makes the SDK ideal for enterprise-grade document management application managers that want to enable document capture from mobile devices. The new Dynamsoft Camera SDK for iOS consists of a programming API for document and image capture from iOS cameras, whether from a snapshot or a video stream. It lets users capture documents using an iPhone with desktop-scanner quality. This makes it ideal to capture mission-critical documents such as contracts and forms, ID cards or driver’s licenses, passports, receipts, presentations, and more. The SDK provides a variety of built-in features to process captured documents. Automatic border detection finds the boundary of a document during a video sequence. This ensures accurate captures of the complete document by avoiding document cut-offs. It also provides trimming by extracting the document from a cluttered or clean background. This includes perspective distortion (trapezoid) correction. Image enhancements include the cleanup of most noise, shadows, distortions and other photo artifacts. In addition, users can be given image processing options for rotating, cropping and converting to grayscale. Users can also import local images or export captures as JPEG, PNG or multi-page PDF files. Files can be saved to the phone’s local storage or to a remote server. Use of the SDK in an application occurs offline. So, all operations take place on the user’s iPhone. Thus, no network connection is required. Also, developers can fully customize the style of UI elements, such as icons and text. Dynamsoft Camera SDK iOS Edition is written in Objective-C and can be used natively for App development of Objective-C and Swift 3 projects. 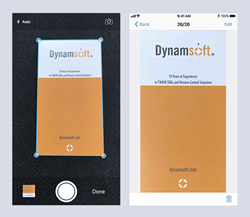 Dynamsoft Camera SDK for iOS is now available for purchase and download from the Dynamsoft website. The software is licensed on a per-device basis. Purchasing includes maintenance to cover updates and premiere technical support. Award-winning technical support channels are offered including, email, live chat, forum and phone. Dynamsoft Corp. provides enterprise-class TWAIN™ software development kits (SDK), a Barcode Reader SDK, and a Camera SDK to help developers meet document imaging requirements for developing web, mobile or desktop document management applications. The company also provides enterprise-grade version control software to help developers manage developer teams and projects. The imaging SDKs help today’s businesses seeking to migrate from wasteful paper-based workflows to efficient electronic document and records management. Dynamsoft is an associate member of the TWAIN Working Group that develops TWAIN standards. Thousands of customers use Dynamsoft's solutions. Customers include 3M®; Apple®; EMC®; FUJIFILM Medical Systems U.S.A., Inc.; Fujitsu®; GE®; H&R Block®; HP®; IBM®, Intel®; Infosys®; Lockheed Martin®; Olympus®; Philips®; PricewaterhouseCoopers®; Samsung®; Siemens®; Symantec®; Unisys®; Verizon®; and more. The company was founded in 2003. More information is available at http://www.dynamsoft.com.